The moorland that encloses Upper Nidderdale may appear to be wild and uncontrolled but it is carefully managed principally for raising grouse for shooting. Heather is burnt in patches to create a variety of different sward heights to benefit grouse for both breeding and feeding. Within the moorland there are several internationally important habitats and species, including rare ground-nesting birds which benefit from grouse management. Moorland habitats are also important for tackling climate change, due to the large quantities of carbon they store. The moorland in Upper Nidderdale is among the most important in the country for its blanket bog and heather habitats and the breeding populations of wild birds that these support , particularly merlin, snipe, curlew, lapwing and black grouse. A range of mini-habitats can also be found with other dwarf shrubs like bilberry and crowberry, wetter areas with mosses and sedges and scrub or even oak trees in sheltered gills. Why is blanket bog important? They support a unique array of flora and fauna such as specialist Sphagnum moss species, sundews, short-eared owls, golden plovers, and common lizards. 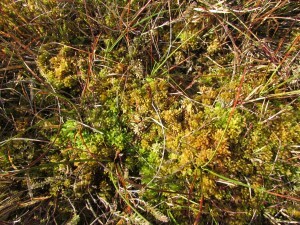 Sphagnum is a vital peatland species as it can hold water- it hosts many different insects and other invertebrates which provide food for ground nesting birds. These unenclosed spaces provide breeding and feeding habitat for many ground nesting bird species, snipe, dunlin and golden plover which nest on the blanket bog. Tall heather provides nesting habitat for curlew, and merlin, while lapwing have adapted to nest on the burnt bare patches. Many of these upland bird populations are nationally in decline, with lapwing and black grouse on the red list of Birds of Conservation Concern and curlew is listed as globally near threatened. Conserving moorland habitat is a priority for combating climate change because of the large quantities of carbon that are locked away in the moorland’s deep peat. In fact, globally, peat contains the largest amount of carbon of all terrestrial ecosystems so conserving our moorlands is as important to climate change as conserving the rain forests. In damaged peatlands, carbon is released to the atmosphere in the form of carbon dioxide. By restoring and conserving peatlands, the release of carbon dioxide is prevented.